There was never any doubt that Ducati would get the Scrambler into the hands of customizers before it even went on sale. This is the result. Let the flame wars and/or lovefest begin. 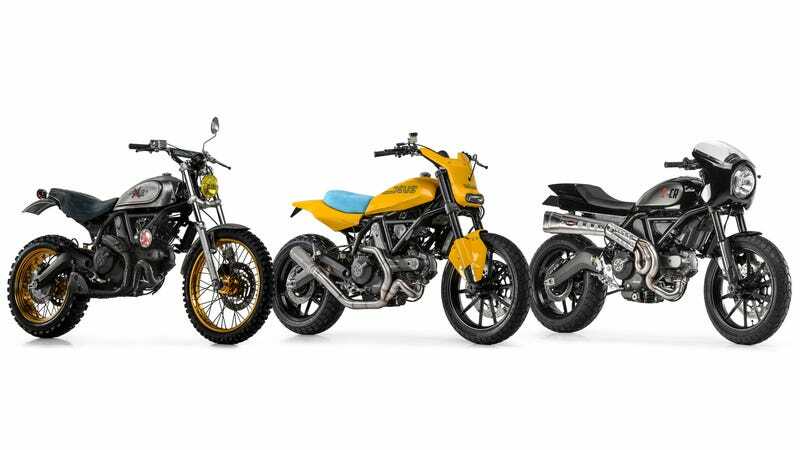 Ducati gave three shops the first crack at customizing the new Scrambler, all from Italy and all debuting this week at the Verona Motor Bike Expo. Ducati picked the usual suspects, with Deus Ex Machina, Mr. Martini, and Officine Mermaid ripping apart different versions of the Scrambler to show off the potential of Ducati's new entry-level ride. Here's what they came up with. Deus' Milan outpost is responsible for the most imaginative and polarizing of the trio. The Scrambler was stripped to the frame before new aluminum bodywork was crafted, including a single-piece tail and a headlight/fairing combo "inspired by speedway bikes". The asymmetrical front mud-guard stays true to Deus wackiness, but the custom pipes should be part of the Scrambler catalog, stat. A cafe-style Scrambler was a given considering Ducati didn't offer its own version from the factory, but Mr. Martini's selection of the Urban Enduro model for the base is a bit confusing. Despite the lowered bars and new front fairing, it comes across as oddly upright, but the riding position has been shifted thanks to some new footpegs. Mr. Martini also shifted the rear suspension and made a custom tail, then topped it off with that high-mount exhaust everyone's been asking for. Officine Mermaid went the other direction with a Classic, stripping it to the bone, then adding knobby tires to upside wheels (21-inch in front, 18-inch in the rear), an under-engine exhaust, metal mudguards, a new rally-style headlamp, and a spotlight on the side. The whole thing comes across as kind of rough, which is exactly what they were hoping for with the stripped and hand-brushed metalwork.